For the month of February, Tech Coach HQ will be focusing on ‘Technology and Families’. Recently I attended the Kids Business #Bloggers_BBQ held at ‘The Point’ in Albert Park. Here I got to meet Nic Lansdell from ‘Bizzibrains’ . Nic was a finalist in the 2014 AusMumpreneurs awards held last year. It was great to connect with an app developer who has developed an educational app that has outcomes, rather than just ‘playing’. Many of my friends have children who are transitioning from home to Three year old Kinder, from Three year old Kinder into ‘Big Kinder a.k.a. Four Year old Kinder and then of course into Prep. Depending on what state you are in, will depend on whether these kinders are attached to a school. For example in Tasmania, the Four Year old kinder is attached to schools (where I grew up) and here in Victoria this is not the case unless you are at a private school with a Four year old Kinder attached. This process can be traumatic for both children (and parents). 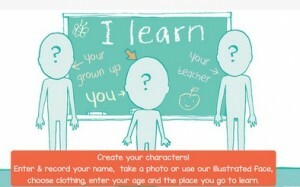 i Learn has been developed to be an interactive story book and to mix illustrations and elements of a child’s identity. 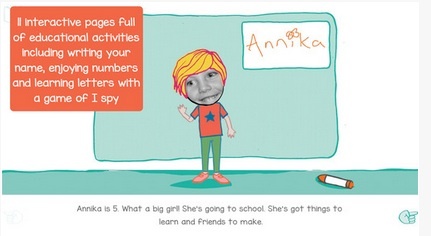 These include using their own photo, adding personal elements such as skin colour, clothes and then adding their own name for the interactive story. I do like that it is an Australian voice over prompting certain steps along the way. Both my daughters enjoyed setting this up and enjoyed the creativity and variety of clothes! My 3 year old Adriana (in 4 year old Kinder) loved putting the items in various places in order to proceed to the next page. It was great to see the modelling for her name (and having to copy her name underneath). As a teacher and a parent, love when there are subtle cues for children to follow – i.e. they are learning through an interactive game (rather than consuming content all the time). The voice cues are great when a child might get the question wrong, encouraging them to have another go rather than just moving onto the next activity. All the elements of i learn are things that all parents face with their kinder or prep child. In our family, sometimes we have an issue getting Adriana ready in the morning, so the page getting ready for school was very hand to have. Like any social story, where a child can have their name read aloud and watch the words is essential for developing literacy skills. It is great to see numeracy activities scattered through the story such as the board game and dice to get to Kinder. The counting activities are also engaging because if a child is more advanced in their counting skills, they can attempt harder activities. My only thing is the sounding of ‘Math’ instead of Maths for the numeracy activities. During one of the activities ‘I Spy’, it’s great to see the phonetic pronunciation of the different items in the garden. This mirrors what is happening in the children’s classrooms. It’s great to see that the emotional faces are throughout the interactive app. A child might not be able to describe in words how they are feeling about going to Kinder/School but can tap an icon instead. It is also great for them to understand a child’s emotions which sometimes kids can struggle to recognise. Even my husband enjoyed sitting with Adriana doing this app and was able to engage about what happens at Adriana’s kinder. I will be sharing this with my friends as a way of helping both parents and children (especially as it’s the start to the 2015 School Year). Engaging the parents at the end of the app with appropriate steps (math’s problems) to get to the parent’s resources is a very smart idea. Five Stars and looking forward to seeing more apps from #Bizzibrains.